The painting “Little Fox” could have been titled “All in One”. When Pema Rinzin invited me to submit a painting for the inaugural show at Kate Oh Gallery this painting was the obvious choice. “Little Fox” represents a symbolic culmination of many experiences and relationships in my life. Each element has an entire story behind it and I was compelled to bring them all together in one setting. This painting was created over the course of four years and much like the reflection of our memories; my goal was to create a painting the viewer can daydream in. 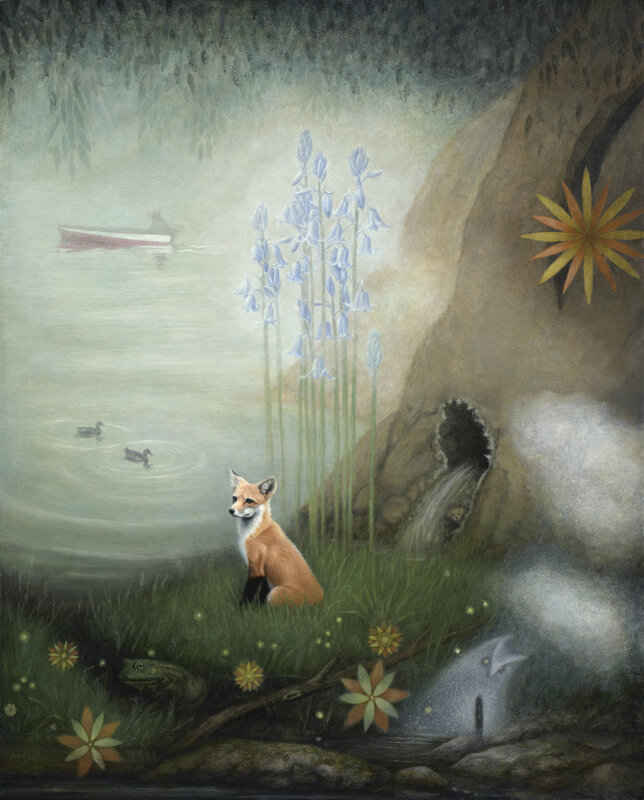 The painting is titled “Little Fox” because the fox was the last element added to the painting. When the fox was added I knew the painting was finally complete. I saw this fox in the suburban backyard of the house I grew up in. In all the years I lived and visited there I had never seen a fox so this was an unexpected and delightful surprise. The fox represents that child-like delight we often experience when coming upon wildlife in nature or domestic settings. The traditional mediums of egg tempera and oil paint come together in honor of the artists throughout history who have helped shape and bring to life my artistic vision. Susan McDonnell reveals microcosmic worlds in the natural curiosities she finds in the garden just outside her studio and in recent travels to her home state of Minnesota. Exquisite rendering of minute details, imaginative juxtapositions, and dramatic stage lighting give her images of flora and fauna an aura of magic and the allure of Old World craftsmanship. These are places where the veil between the worlds of dreams and reality becomes translucent. Walking in nature and the transcendent experience of coming upon wildlife has been a great influence on her current body of work. While the elements of each painting are exactingly realistic, there is an undercurrent of the subconscious running through them; we recognize all the elements with a quiet sense of another world beneath the surface. Susan McDonnell received both her Bachelor of Fine Arts and her Masters of Fine Arts from Art Center College of Design in Pasadena. She currently teaches at Mount Saint Mary’s University in Los Angeles. She has shown extensively in Los Angeles, Santa Barbara and Santa Fe. She is represented by Sullivan Goss Gallery in Santa Barbara, California.